Are you guys as obsessed with grilled cheese sandwiches as I am? I am a true grilled cheese lover. And adding a egg just blows all other grilled cheeses out of the water. Technically this recipe isn’t a grilled cheese at all, just a single slice of bread with cheese fused to it’s outsides, but it’s cheese and it’s grilled so I’m not going to argue technicalities. If we did want to get into the technicalities of naming of recipes, I think the egg-in-toast part of this recipe confuses me as well. I actually love eating the little cut out of toast, so I don’t think of them as leftovers at all. In fact, they are perfect for dipping. This recipe looks pretty impressive, especially when you cut into the egg yolk, but it’s incredibly simple to make. Crisping up the cheese on the outside of the bread instead of the inside, changes the texture of the cheese from gooey to incredibly crispy and addictive. Think of it like an inside out grilled cheese. How is everyone’s 2014 going so far? Mine has been filled with long walks around Tokyo and a quiet dinner making takoyaki in front of When Harry Met Sally. It’s an oldie, but a classic, especially for New Years. Hope everyone’s new year is off to a great start and I hope you have lots of grilled cheese in your future! In a non-stick pan, over medium-low heat, melt 1/2 tablespoon of butter, swirling the pan to evenly coat. Sprinkle 2 tablespoons of cheddar in the rough shape of your toast with the hole cut out. Add the bread on top and grill on medium-low until the cheese is crispy and golden. Remove the toast from the pan, melt the other half of the butter and swirl to coat. Arrange the remaining cheese in the shape of the bread and place your toast in the pan, cheese-less side down and crispy cheese side up. 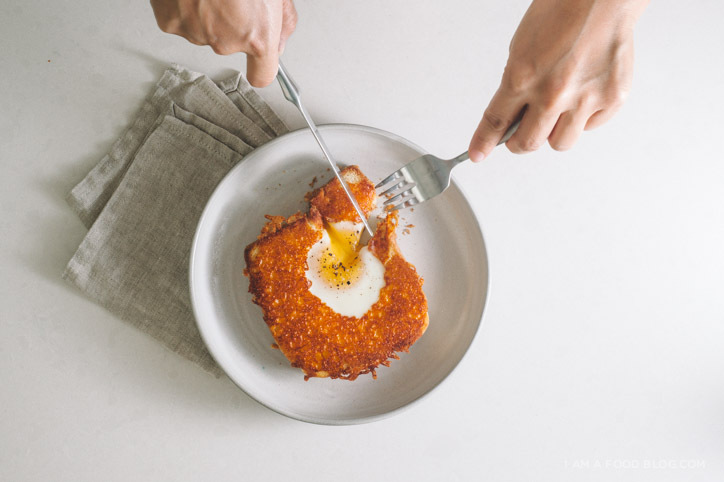 Crack your egg into the hole and cook on medium-low, covered (use a glass lid if you have one so you can see) until the egg is done to your liking. Enjoy immediately with salt and pepper. PS – Some other obsession worthy grilled cheeses: Pierogi Grilled Cheese, Classic Grilled and Crab Rangoon Grilled Cheese. I just love it!!!!! Great idea and so good looking pictures! I just tried to make this…mine didn’t look as pretty as yours ( I didn’t make the hole big enough for the egg and had to flip it over to fully cook it so the other side of the bread wouldn’t burn). However…It was still delicious and I will be attempting it again! Such a great looking recipe from so simple ingredients! I am digging this soooo hard! I love that there’s only one piece of bread! More egg and cheese! Yuuummmmm. I’ve made these before but never with the cheese crust. What a brilliant idea! I am a fan of the grilled cheese. I have definately had my fair share. I like the crunchy cheese in your version! Ah simply amazing food! I must try this!!! I tried it and loved it so I decided to add hash browns and bacon :D even better! 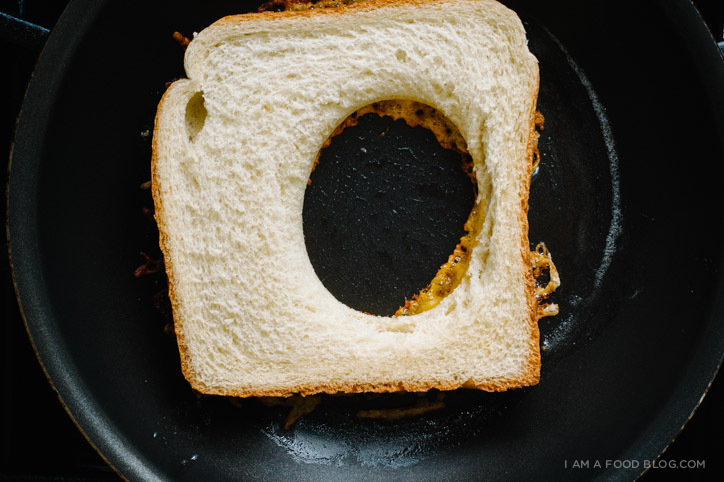 when my mom made toad-in-a-hole’s for breakfast she would make a bunch of tiny grilled cheese’s with the circles cut of of the bread. Holy crap. Also, has anyone ever told you how beautiful your image and text design is? Because, Damn. The recipe calls for “1 SLICE THICK TOAST,” but per the images it looks like just regular-thickness untoasted bread (and for some reason white bread at that). Ooh, yum! I’m going to try this for sure! It’s screaming ‘Sunday evening snack’ at me! This is just great, we can call that a croque madame façon tatin! Should probably specify a Small Egg for this recipe. I doubt a large or jumbo egg would end up as pretty as the photo. 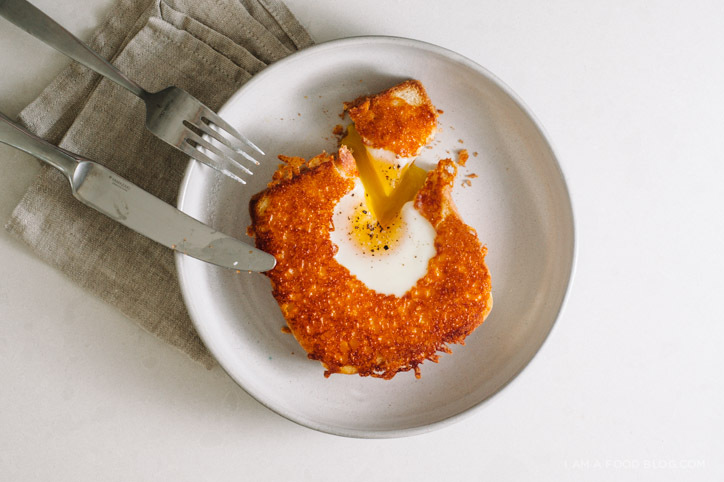 Have eaten egg-in-a-hole all my life, but never with cheese. This will blow my kid outta the water! I’m going to bet that this was invented to use up bread that was home-baked and had a big bubble inside of it, rendering it useless for sandwiches, etc.- and not wasting any bread from the middle, because there was none to begin with! Thanks for this fun & cheesy idea! Everything is better with cheese! Hope your kid likes it Annie! We made this when we were kids. It was called “Egg In A Frame”. wow, I just love egg sandwich. This Grilled Egg and cheese recipe is outstanding. As it is looking delicious, I must try this at home. thanks to share this great recipe. Cheese looks overcooked and burnt…basic idea is good though. It looks very impressive. Maybe something to try to get my daughter to eat egg! I made this exact thing growing up! Love it. Took a try to get the egg hole thingy just right, but i’ve got it now. Yummy, but it takes a bit longer & is messier than I expected. Go for it– what a wonderful breakfast/lunch/brunch! My eyes just rolled WAY back in my head! When I was younger I used to make those but without the cheese and I called them one eyed jacks. It still looks good after all these years. 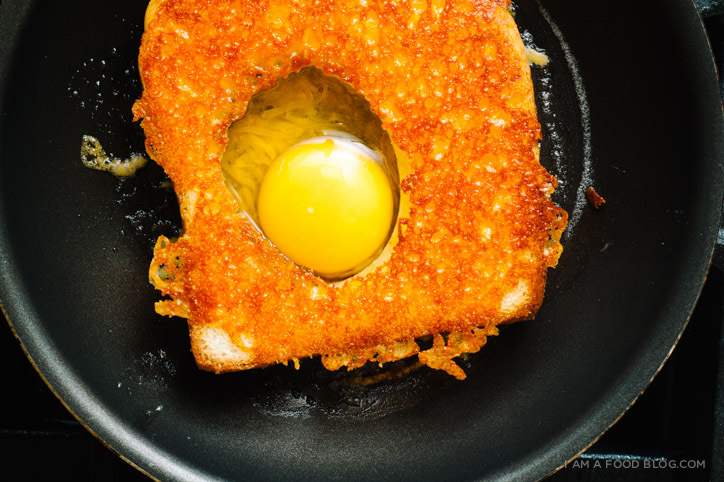 What an awesome alteration to what I call egg-in-a-hole. Just looking at the pictures I can imagine the cheesy goodness. This is definitely on my to try list! INSANELY CHEESY AND DELICIOUS LOOKING. I normally am not a fan of capital letters, as they’re rather intimidating…but the excitement over cheese on toast made me as giddy as a hungry kid. OMG…this is outrageous and I can’t wait to make it! It takes a Toad in the Hole to a whole other level! saw it… made it… loved it!!! Grilled cheese is my absolute favorite thing! Never had it with egg though… Can’t way to try this at home! My mom has made this since I was a kid, it is delicious. 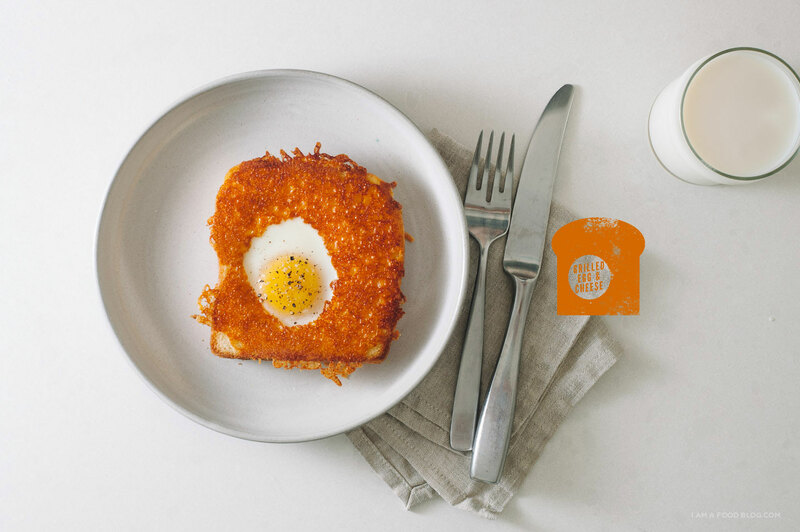 The photos here are amazing and I’m sure that this egg “grilled cheese” is delicious. I love making egg in a basket, but I’ve never thought of adding cheese, but I’m definitely trying this out the next time I make it. 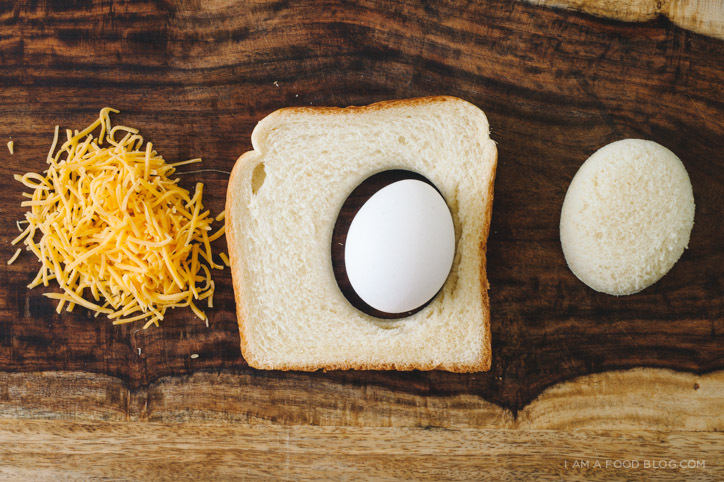 There’s something about putting an egg in bread that makes it better, don’t you think? This looks awesome!!! I just found you on StumbleUpon. So glad I did! I make extra cutouts for dipping! 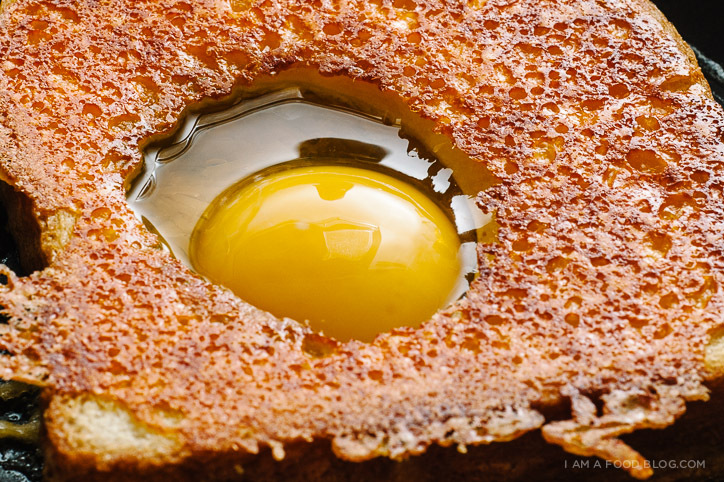 Also, I grew up with the name being an “egg in the hole”. Yummy, & this recipe sounds great! It’s called an egg-in-the-hole. Duh! We call them egg in a nest. I’ve never used cheese. And melting it first? That’s plain brilliant. 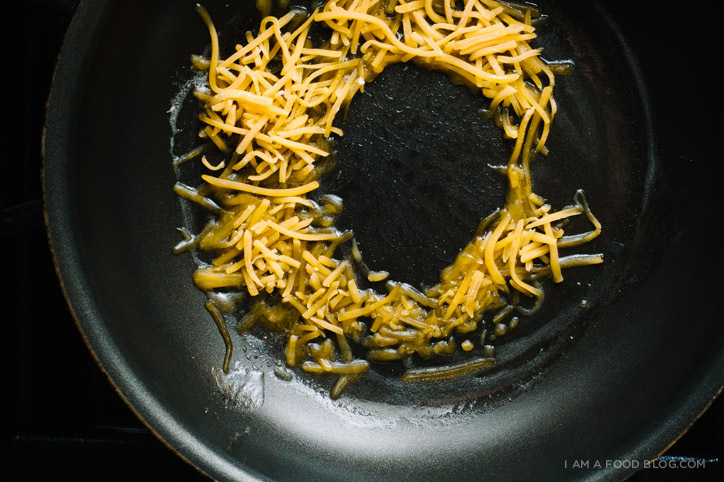 We call these “Egg in a hole” or “Eggs in a basket” but I have NEVER thought to put cheese in the pan first. That looks insanely delicious! 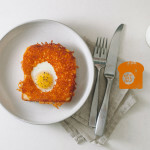 Cheese, egg, and toast for a perfect breakfast! Add along a cup of coffee, then you have your morning food set up and ready to go. Thanks for sharing!